I had two major “Ah-ha!” moments in my recovery.1 The first one occurred as I was browsing the psychology section at my local Half-Price bookstore. I was looking for some books for my job as a school psychologist when Almost Anorexic caught my eye. I flipped through it and, although some parts intrigued me, I put it back on the shelf. Then I picked it up again. I thought to myself, “There is no way I’m anorexic. I’m just healthy and lean!” But when I scanned through the book, I saw myself in the personal stories about obsession with body image, food, and exercise. I decided to make the purchase. 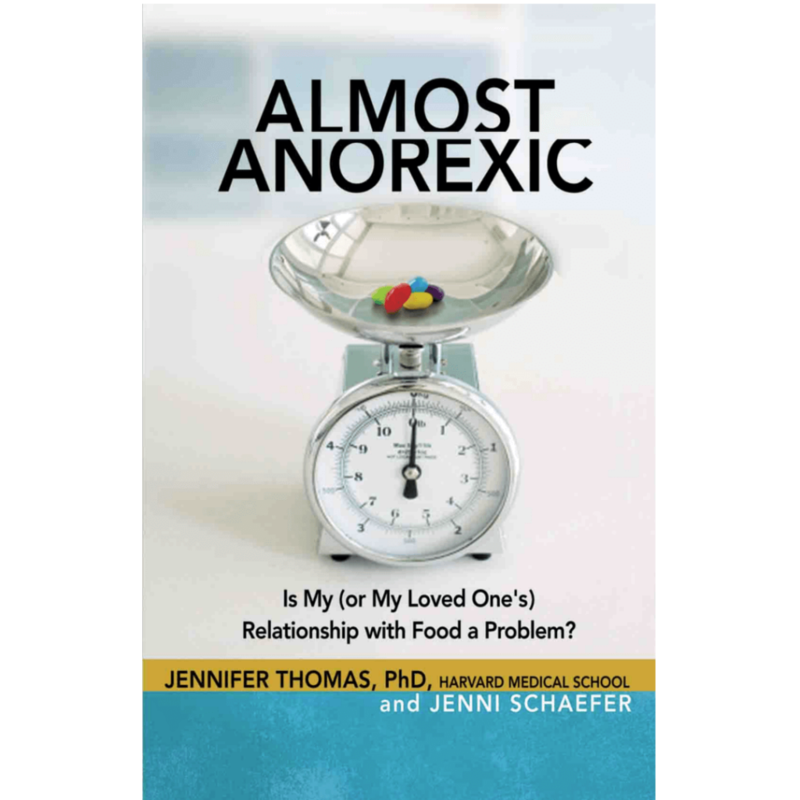 At the time, I told myself that I didn’t know why I was buying the book; I was not anorexic. Now that I look back, I believe this book called to me for a reason. I think my subconscious knew something that my conscious mind didn’t. Apprehensively, I started reading the book. I told myself that I would be open-minded about what I read because maybe, just maybe, I have a teeny issue with food. Right off the bat in chapter one, I had to face this head-on. There was a screener called the Eating Attitudes Test (EAT-26) which wouldn’t diagnose anything but would let me know if I needed to speak to a professional. I was totally honest with myself as I took this screener. “I am terrified about being overweight” Always. “Other people think that I’m too thin” Usually. “I am aware of the calorie content of the foods that I eat” Always. When I was done with the screener, I had to calculate my total score and, if it was over 20, I should consider seeking out the help of a professional. As I did the math, my inner Deborah chuckled nervously and said, “There is no way my score will be over 20. Okay, maybe a little, but I certainly don’t have a eating disorder!” My score was a 33. To put it simply, I was stunned. Sure, it wasn’t the maximum score, but it was a lot higher than I had expected. I let this information sink in for a bit and decided that this was something that I should take seriously. I sat down with my husband a few nights later and confessed what was going on with me. I shared my screener results with him and that it might be best if I go to my general practitioner to see if I needed to look into this further. He didn’t disagree with me. I made the doctor’s appointment and my husband accompanied me when the time came. I optimistically hoped that my doctor would brush off the screener and tell me that I was fine, but I ended up being labeled as “underweight” and told to see a dietitian and a therapist. Okay. So, I had an eating issue. Did I have an eating disorder though? I guess it depends on who you ask. My dietitian said it wasn’t anorexia while my therapist gave me the diagnosis of Unspecified Eating Disorder for insurance purposes. I hated having a label slapped on me even if it was the very vague “unspecified eating disorder” rather than the harsh “anorexia” label, but there was something amiss and I couldn’t ignore it any longer. When did you realize you had disordered eating or an eating disorder? Please share in the comment section below. 1The second one was when I watched the video “When the Fat Girl Gets Skinny”. 2As a side note, I want to mention that this book talks about all eating disorders and not just anorexia. 3Epilogue: I retook the EAT-26 screener a little over a year later and I’m happy to report that my total score had dropped all the way down to a 6! I Am an Emotional Eater. So Now What?